As more easy sweet treat (compared to Valentine Ice with cherry) for your Valentine you could bake these scones with cranberry, raspberry and white chocolate. As extra touch you can use a cutter in heart shape. 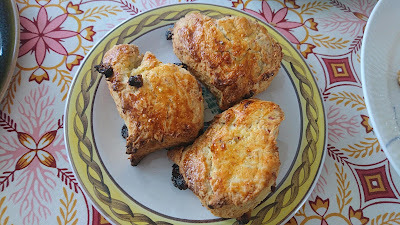 I have been using this recipe on cranberry - orange scones as starting point, while creating these Valentine scones. As a more indulgent Valentine Scone you could also try out these Valentine romance scones. Mix the cranberries, raspberry and white chocolate together in a small mixing bowl. Add in the cranberries, raspberry and white chocolate. Bake the scones at 200'C for 15 minutes, until golden.